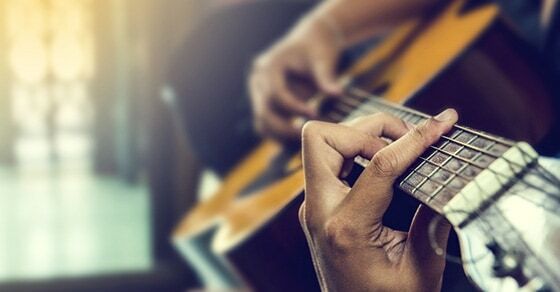 Are you interested in learning classical guitar? Are you new to guitar altogether? Then you’re in the right place. We’re about to take a look at what you need to know to get started in classical guitar, a musical style some consider an art form unto itself. Classical guitar can be difficult, but anyone can learn the basics, given some patience and attention to detail. Let’s take a look at what you need to know as a beginner. Or if you want, you can check out the more advanced guitar video lessons. Although you can learn to play classical music on any guitar (purists would disagree with me there), if you have any intention of studying and learning classical guitar over the long haul, you’ll want to buy a classical guitar. Classical guitars do look a lot like standard steel-string acoustic guitars, but there are definitely some differences. For one, the strings are made of nylon as opposes to steel. For another, the neck is much wider than on most electric or acoustic instruments. The neck is also shorter, not allowing for much access to the higher frets beyond the 12th fret. Most other differences can be summed up as decorative. Classical guitars can also be great instruments for beginners, as they tend to be a little easier on your fingers than steel-string guitars. But if you have short fingers, it might not be the best idea to invest in a classical guitar off the bat. Sit up straight on the edge of the chair, and place your guitar on your left leg (right leg if you are left-handed). Hold the guitar at an angle. You might want to consider purchasing a footstool, as this will make it easier for you to maintain proper posture. In general, I believe in being comfortable while playing guitar, and not contorting my body into weird positions unnecessarily. 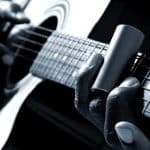 But proper classical guitar technique requires that you follow the previously mentioned instructions, and in theory, it should give you a little more control over your instrument, particularly for more difficult pieces of music. Here are the basics. Your left hand (or fretting hand) should have shorter nails. I would suggest keeping them trimmed at all times, as longer nails can make it harder for you to fret strings properly and get a good sound out of the notes. Your right hand (or picking hand) should have longer nails (yes, even if you are male), but there’s no need to go overboard. Also, you don’t really need to grow a nail for your pinky finger. Most classical guitarists don’t use it, but that doesn’t mean you can’t. When picking notes, I prefer to use the tips of my fingers as opposed to my nails, but growing nails does give you more options. You can pick with just your nails, the tips of your fingers, or both, for different tonal combinations. This might take a little getting used to. Fortunately, “i” and “m” are exactly what you’d expect them to be, so it’s just a matter of remembering what “p” and “a” stand for. There aren’t really any hard and fast rules in modern classical guitar. Some players actually do incorporate their pinky into their playing style. But typically, you would use your thumb to play the bass notes, and your other fingers to play the higher strings. This also isn’t a set-in-stone rule. Finally, and most importantly, classical guitarists are typically tasked with learning to read music in standard notation as opposed to guitar tablature. This is not an easy task, but also not impossible. But I will say this: standard notation clearly wasn’t developed with guitar in mind. It’s not like a piano where you can easily and visibly see where one octave transitions to the next. The same notes (at the same octave) exist at several different locations on the guitar. In my opinion, both tab and standard notation have their place. They are both valuable tools for learning music. But standard notation is necessary when we’re looking to understand the duration of the notes, time signature, tempo, dynamics, and so on. As you’re surely beginning to see, standard notation is an in-depth subject, and not one we’ll be able to cover in extensive detail. But let’s go over the basics so you can get a head start. Tempo. This is the speed at which the song is played, a value usually represented in bpm (or beats-per-minute). Dynamics. This term describes the overall volume at which the piece is played, from very quiet all the way to very loud. Multiple transitions can happen in a single piece. Time signature. This is also called the meter, and is represented by values such as 4/4, 3/4, and so on. It tells us how many beats per bar there are, as well as the overall “feel” and rhythmic quality of the piece. Notes. Whole notes, half notes, quarter notes, eighth notes, and other similar terms are used to denote the duration of a note. More on this below. Every note type looks a little different. 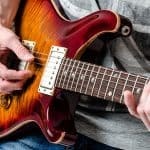 You will need to learn to recognize the different types of notes to in order to play them for the correct length of time. 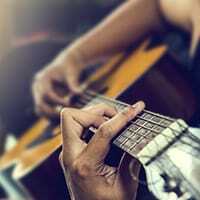 Classical guitar is an in-depth subject, and not one we can cover in just one guide. But the above concepts are all really important when you are looking to get started. Study them well, go over them multiple times, and embed the concepts in your mind.